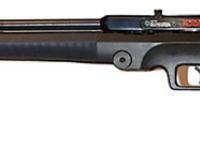 Domi8or Rifle. 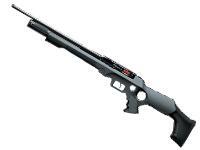 An ideal hunting rifle, the Logun Domin8or is a gun you can carry and shoot all day long. The durable, all-weather, ambidextrous, synthetic thumbhole stock is scratch-resistant and stands up to hard use and weather conditions that wood stocks cannot. The pistol grip and forearm are raked to give you extra control, while the rubber buttpad is adjustable up and down to suit your shooting preference. The underneath side of the stock's forend has Weaver-style grooves for mounting a flashlight. The Domin8or is powered by high-pressure air from a hand pump, electric compressor or scuba tank. Below the free-floated barrel is the built-in manometer (air pressure gauge), which keeps you informed on how much air is left in the removable air reservoir. And, since the air reservoir is removable, you can precharge extra tanks and take them along on your hunt. Never run out of air, again! The three power levels let you determine how much power and how much air is used with each shot. This rifle is powerful, delivering up to 35 ft.-lbs. of energy! The 8-shot circular clip automatically moves forward to the next slot when you flick the biathlon-style sidelever, which is also textured for a sure grip. The clip stands proud of the rifle so you can see if there's a pellet or an empty slot moving into alignment. If you plan to do a lot of shooting (and, with this rifle, you will! ), get some extra clips and load and stash them in the circular holder directly above the grip. It doesn't come with sights, so you'll need to mount a scope on the 11mm dovetails. Click on the AMMO link for a list of recommended pellets. Check the ACCESSORIES link for additional rotary clips, scopes and rings, extra air tanks and maintenance items. Refurbished Left hand Domi8or rifle. Perfect working condition. Looks and works like new!